After two and a half years of planning, public debate, political campaigning, demolition, and preparation, ground was broken – at least symbolically – on Nov. 11 for the first phase of the Confluence Project in downtown Eau Claire. “From an idea gingerly introduced into the public’s mind in May of 2012, to today breaking ground on the first physical manifestation of that idea, finally we lift the corner on the first page of a new chapter in our city’s story,” City Council President Kerry Kincaid told a crowd of several hundred people crammed into the lobby of the State Theatre, a few blocks away from the snow-covered development site. Moments later, Kincaid and a dozen other business, university, and community leaders donned hard hats and grabbed shovels to pose for photos in front of a massive image of the soon-to-be-built Haymarket Landing. A fresh blanket of snow prevented a literal groundbreaking, so as they have at many points in the arduous process of bringing the Confluence Project into reality, those involved had to turn to alternate plans, bringing the ceremony indoors. Kimera Way, president of the UW-Eau Claire Foundation, one of the project’s partners, noted that the snowfall was symbolic of the many twists and turns the project has taken. Haymarket Landing is being built by Haymarket Concepts, a partnership composed of Commonweal Development, Market & Johnson, and Blugold Real Estate, a UWEC Foundation subsidiary. While the 119 apartments at Haymarket Landing will be marketed toward college students (as well as others who might want to live downtown), the facility will be privately owned and operated. 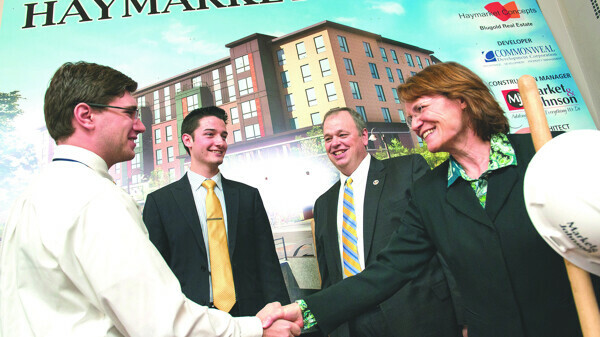 The apartments will help alleviated the shortage of on-campus housing, said UWEC Chancellor James Schmidt. “We think this location is going to be perfect,” he added. Dan Clumpner of Commonweal Development noted that property tax revenue generated by Haymarket Landing will help fund the performing arts center and an adjacent public plaza. “We mustn’t forget that we’re not going to have a completed project until both this building and an arts center stand majestically on that site over the confluence of those two rivers,” he said. While the Nov. 11 ceremony was symbolic, actual construction work is underway, with the installation of so-called “geopiers” to stabilize the site soon to begin. Completion of the building is slated for June 2016.